Baldwin Special – Stromberg equipped ! Ok, from one to ten, how cool is this picture? The red ‘sports rod’, the chequered flag, the white racing overalls, the haircuts, the big steering wheel, the female interest. Man, it’s got it all. Looks more like a shot from a 1950’s thrills and spills auto movie. But it’s real – entitled, ‘Dad’s win in 1956’. Huge thanks to Stu Hanssen, of Santa Ynes, Calif for these great pictures of his Baldwin Special, once owned and raced by his Dad, William M Hanssen. Stu managed to locate the car – for sale – in Connecticut via an internet appeal in old race car circles. Its original builder Willis Baldwin of Santa Barbara, Calif, built four Specials and William’s was the last, built on a ’48 Merc frame with transverse leaf front spring, coils on the ’52 rear end and the big Stromberg equipped Merc flathead with monster Ardun conversion. Raced by William, it participated in at least four races during the 1956 season, entered as a Baldwin Special. 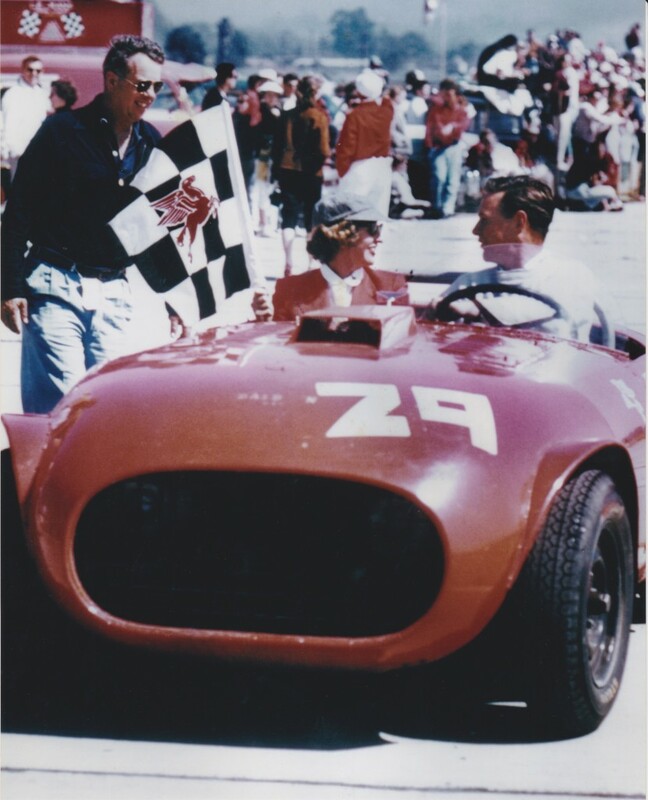 It also saw action in the March 12th, 1955 Preliminary Palm Springs Race, where Hanssen shared the track with Carroll Shelby, Ernie McAfee, Ak Miller, and Chuck Daigh. Naturally, Stu is keen to get the car on the track himself, and we certainly can’t wait to see it back where it belongs. There are a lot of great facts about the other Baldwin specials on Tam’s Old Race Car Site and more pics of this cool car on the Connecticut Classix website. This entry was posted in Other cool stuff and tagged 97, Ardun, flathead, Special, Stromberg equipped by Clive. Bookmark the permalink. This is a really cool car. We at Sakowski Motors got to work on it here in Los Angeles, CA. Getting it back together and running again. We had H&H Flatheads do the motor for us. They did a great job.